We have drivers who give lifts to our older users, this may be to a coffee morning at the charity or to a private GP appointment. 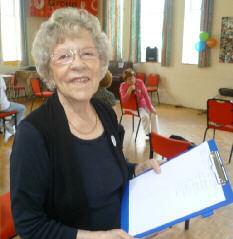 Other volunteers help run coffee mornings, exercise classes and afternoon teas. What qualifications does a volunteer need? No formal qualifications are needed and our volunteers come in many shapes, sizes, and are of all ages. Some volunteers are looking for work experience or to improve their CVs, others are keen to use their skills after retiring. The things they all hold in common is a desire to help those in a difficult situation, an enjoyment of getting to know others and a feeling that they can make a difference to someone’s life. If you hold a particular qualification or have a particular talent, its always good for us to know. We often have talks from interesting people and at our monthly teas have performances from musicians and entertainers. Ho do I get involved? We always welcome new inquires so please e-mail, telephone or write to us at Chorlton Good Neighbours. Please be aware that all potential volunteers are DBS checked and are given guidelines within which to work that must be adhered to. Once potential volunteers have passed a DBS check they are offered induction training around confidentiality and boundaries. Regular support is offered through the Coordinator and at specific training sessions with a freelance trainer. Thought is always given to where potential volunteers might best be suited, where their skills lie and what other interests they have which could be used within the Care Group, such as updating a website, doing research, giving a talk or running a photographic workshop. ‘Every little helps’ even if you don’t feel you have a specific interest or talent , visiting an elderly person at their home or taking them to the shops can be a very satisfying and an incredibly worthwhile activity – making a huge difference to an elderly or housebound person. If you have an hour or more to spare please get in touch for more information.